Compliance professionals face a myriad of challenges as the separation of business and compliance supervision roles becomes more complicated. In the CLE course, FINRA staff will be joined by industry practitioners to discuss how firms are re-defining the rules of supervisors and compliance personnel and the three lines of defense and their application to the risk model. The course will compare the first two lines of defense and explain how firms can create a culture of compliance. 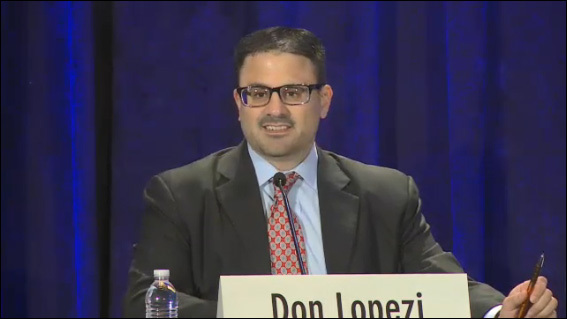 Don Lopezi is Senior Vice President and Regional Director of FINRA’s West Region. The West Region consists of the District Offices located in Denver, Los Angeles, San Francisco and Seattle. The West Region is responsible for conducting examinations, investigations and ongoing surveillance of broker-dealers and registered persons located in the western half of the United States. Previously, Don was the District Director of the FINRA San Francisco District Office. Prior to joining the San Francisco Office, Don was a Director of FINRA’s Examination EPG, among other things, authored and maintained examination policies and procedures used by FINRA’s examination staff, coordinated national special projects and initiatives, and oversaw the national examination program—the regulated firm-focused examination and surveillance activities conducted by FINRA’s Member Regulation Department. Don began his career as an Examiner in NASD’s Denver District Office in 1992 and, after serving as a Supervisor in the Denver District Office, joined the Washington, DC, office in September 2003. He graduated from the University of Colorado at Boulder with a B.S. degree in Accounting, and received his MBA from the University of Colorado at Denver. Alexander “Alex” Schneble has been the Director of Private Wealth Management Compliance at Robert W Baird (“Baird”) since 2013. Mr. Schneble leads the compliance program for the firm’s retail brokerage and advisory business. He originally started at Baird in 2000 and in 2002, he transitioned to Northwestern Mutual Investment Services (“NMIS”) where he established firm policy for the new brokerdealer and investment adviser, helped shape the firm’s brokerage and advisory programs and was one of the key individuals responsible for building NMIS’ supervisory system. Mr. Schneble rejoined Baird in 2011 as the Director of Regulation and Policy responsible for assessing new regulations, industry trends and disciplinary actions. Upon transitioning to Private Wealth Management Compliance in 2013, he led the effort to redesign Baird’s supervisory system to strengthen its capabilities so it could continue to support the firm’s substantial growth and diverse product offerings. David Greene is District Director of FINRA’s Los Angeles District 2 Office. He served in the same role at NASD before its 2007 consolidation with NYSE Member Regulation, which resulted in the formation of FINRA. In his capacity as District Director, Mr. Greene oversees the sales practice oversight process of FINRA-regulated securities firms based in District 2, as well their employees, with responsibility for ongoing surveillance, examinations and investigations. In January 2000, Mr. Greene joined FINRA (then NASD) as a regional counsel for FINRA’s Enforcement Department, and was based in the Los Angeles District Office. For two-and-a-half years preceding his appointment as Director, Mr. Greene served as the Deputy Regional Chief Counsel, FINRA Enforcement Western Region, where his responsibilities included managing enforcement attorneys in FINRA district offices of Los Angeles, San Francisco, Denver and Seattle; developing and overseeing FINRA’s national non-summary proceedings programs; as well as his own enforcement docket. Among the significant cases Mr. Greene handled were those involving mutual fund share classes, gifts and gratuities, market timing, brokered certificates of deposit, sales practice violations and operational compliance issues. Prior to joining FINRA, Mr. Greene was associated with a law firm in Los Angeles for 10 years. Mr. Greene received his undergraduate degree from Pepperdine University and his law degree from Southwestern University School of Law. Mr. Greene is licensed to practice law in California, and is admitted to practice before various federal courts. He is an executive committee liaison of the Los Angeles County Bar Association Business & Corporations Law Section and is frequently a speaker at securities industry events. Mr. Greene is also designated as a Certified Regulatory and Compliance Professional™ through the FINRA Institute at Wharton. Ms. Tracy E. Calder serves as Managing Director and Deputy Chief Legal & Risk Officer of LPL Financial Holdings Inc. She has been Managing Director and Deputy Chief Risk Officer at LPL Financial LLC since January 25, 2016. Ms. Calder served as Managing Director and Chief Compliance Officer of J.P. Morgan Securities LLC from May 2015 to December 2015 and served as its Head of Brokerage and Fiduciary Compliance since August 2013. At J.P. Morgan, She led a compliance program that spanned the institutional and private client broker/dealer and RIA businesses. She served as Senior Vice President at Wells Fargo Advisors from March 2012 to July 2013, where she led the retail compliance program for the broker/dealer. She spent 18 years with UBS Wealth Management Americas in a variety of legal and compliance roles, including as Head of legal for the Wealth Management Advisor Group and as Chief Compliance Officer and Senior Deputy General Counsel for UBS Financial Services Inc. She earned a Bachelor of Arts in Political Science from Fordham University and a Juris Doctor in Law from the University of North Carolina School of Law.